I’ll start with a confession – we didn’t plan to go to Borneo. We wanted to go to South East Asia, we wanted to go in July… and then we realised that in most SE Asian countries, July is the wet season. Apart from Borneo where, according to the Lonely Planet guidebook, there is no particularly bad or good season to visit. Perfect. And then we reached the sentence that said: ’rain is a real possibility every day, all year.’ Bring it on. I was kitted out for the month-long trip with Vango’s Freedom 80+20 travel bag, and the cavernous main rucksack with the smaller daysack is an excellent combination. The 80-litre pack easily held all of my gear, with space left over to bring home shopping – particularly useful as we finished the trip with a few days in Bali, a mecca for souvenirs and hippy clothes shops. If you are planning a longer trip, like a gap year, this would be a great pack for fitting in all of your kit. Although you carry it like a rucksack, which makes it easy to transport, it opens like a suitcase, so it’s easy to get to all of your belongings. I liked that the rucksack straps can be zipped away, so the bag is compatible with airport conveyor belts. I used the handy detachable 20-litre daysack for everything from sightseeing and travel days to walks in the jungle. It has pockets to keep all your bits and bobs organised, including discreet compartments for money or travel documents. The pack is also compatible with a water bladder, which was great for the hot, hot hiking. Borneo has everything! 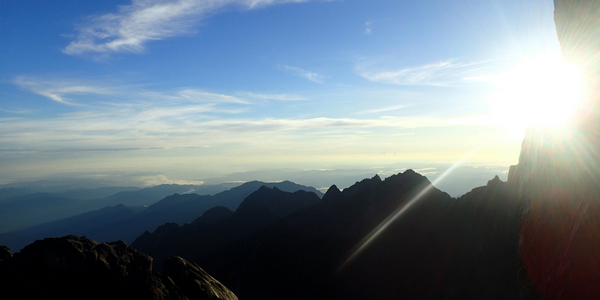 Tackling its highest peak, Mount Kinabalu, is a must. At 4,095m it’s a serious challenge, but you don’t need technical climbing skills – it’s do-able for anyone relatively fit with some experience of hiking. The view from the top at sunrise is breath-taking. There are numerous opportunities to see orang utans. I recommend a jungle cruise in Tanjung Puting National Park in the Indonesian part of Borneo. We saw semi-wild orang utans less than five metres away from us, and by night slept on the deck of our klotok (a traditional wooden boat, named after the noise the engine makes), listening to the sounds of the rainforest, and waking up to see proboscis monkeys jumping through the trees. Swathes of Borneo’s rainforest are being destroyed for palm oil plantations, something we saw first-hand as we travelled across the island. This is the biggest threat to the survival of wild orang utans, and other endangered species, but visiting the national parks and investing in local tourism helps, as it demonstrates that intact rainforest has a value that will last far longer than the short-term gain from farming. We finished our trip with a visit to Mulu National Park, which is only accessible by plane or on foot. The park’s main attraction is its epic cave systems, and watching the exodus of millions of bats from one of the caves each evening. What a finale. 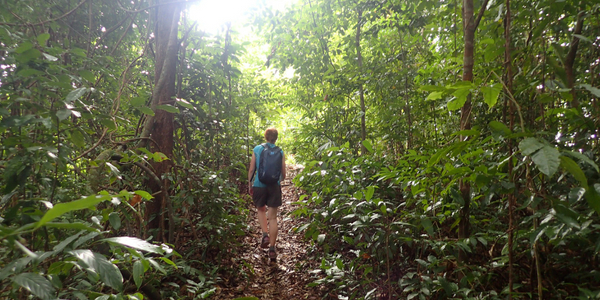 The Freedom 80+20 is a great travel bag and Borneo is an incredible destination. But be warned: it will rain.